23-AUG-2008: Voyager calculator models have been removed in release 0.79 due to licensing issues. They will be made available in a separate package in the near future. Nonpareil is a high-fidelity simulator for calculators. 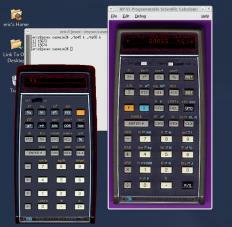 It currently supports many HP calculators models introduced between 1972 and 1982. Simulation fidelity is achieved through the use of the actual microcode of the calculators, thus in most cases the simulation behavior exactly matches that of the real calculator. In particular, numerical results will be identical, because the simulator is using the BCD arithmetic algorithms from the calculator. Nonpareil is Free Software, licensed under the Free Software Foundation's General Public License, Version 2. There is NO WARRANTY for Nonpareil. Nonpareil is not an HP product, and is not supported or warranted by HP. Starting with release 0.74, Nonpareil includes Windows support, though it has had only minimal testing and is considered to be of alpha quality only. Nonpareil requires the GTK+ toolkit. A GTK+ installer is available with the Nonpareil distribution on the download page. The Windows version does not yet have an installer. It is supplied as a ZIP file. Unzip it to a directory of your choice. Run nonpareil.exe, and you will be prompted to select a calculator model by chosing a KML file. Nonpareil does NOT fill your Windows Registry and system directories with useless crap. If you want to "uninstall" it, just delete the directory you installed it into. Nonpareil currently simulates calculators that were developed by HP Advanced Products Division in Cupertino, California, HP Corvallis Division in Oregon, and models which HP Fort Collins division adapted from base designs by APD or Corvallis Division. Models numbers shown with a bullet are currently simulated by Nonpareil. Support for additional models will be added over time. The HP-67 is considered by many people to be part of the Classic series since it is packaged similarly to the HP-65, but electrically it is really a Woodstock series machine. The classic series chip set was also used in the HP-46 and HP-81, which were desktop printing versions of the HP-45 and HP-80, respectively, and the HP 9805A desktop calculator. The same chip set was also used in the HP 1722A Oscilliscope, the HP 3380A Integrator (for Gas Chromatography), and in several HP Gas Chromatographs. The HP-27 was HP's only combined scientific/financial calculator until the HP-27S was introduced in 1986. The HP-10 was a basic four-function printing non-RPN calculator. The HP-01 is a calculator watch (non-RPN). While all the other models listed here use a 56-bit (14-digit) word, the HP-01 uses a 48-bit (12-digit) word. The processor architecture is otherwise similar to Woodstock. Nonpareil is made available under the terms of the Free Software Foundation's General Public License, Version 2. There is NO WARRANTY for Nonpareil. Source code is available for download. Nonpareil development uses the Subversion revision control system. The repository is not currently publicly accessible. I frequently write about Nonpareil development progress and issues in my blog, What's All This Brouhaha? Microcode for several calculator models is included in the Nonpareil source code distribution. This is possible because early HP calculator microcode is not copyrighted by HP. David G. Hicks of the Museum of HP Calculators has provided scanned images of the calculators for use in Nonpariel. Peter Monta dumped the HP-35 ROMs optically! He also found and corrected several typos in the HP-45 and HP-55 code. Maciej Bartosiak improved the display code of my earlier NSIM simulator enough that I now use its rendered output as the background graphic for the HP-41CV for Nonpareil. David G. Hicks has ported the simulator portion of an earlier release to Java and made it available as an applet that may be run in Java-enabled web browsers. There is a PalmOS port of an earlier release by Jonathan Purvis. Egan Ford has ported Nonpareil to the Sharp Zaurus, and reports that it should work on the Nokia N810 web tablet as well. Maciej Bartosiak has developed a Mac OS X port of Nonpareil as well as a port of my earier nsim HP-41C simulator. Tom Fors has developed an iPhone port of Nonpareil supporting the Voyager calculators (11C, 12C, 15C, 16C).